2018 has been a revolutionary year for Destination Impact. Our sales increased tremendously and we opened a new location in Haiti. Thereby, allowing us to make a much larger impact in the communities that we work in. Most notably is the children’s library that we founded in Kisumu, Kenya. 2018 has also been a revolutionary year for me personally. I was featured in major black publications and NY-based media outlets for my work with Destination Impact, my students outperformed most of the state on their math exams; I spoke at an ed conference held by one of the biggest funders in the education space, quit my job as a school leader in June to travel the world (currently 10 countries in), and co-authored a book. That doesn’t even cover all the highlights. There were plenty. There have also been some pretty harsh moments that I have endured as well - A bad breakup, a denied charter school authorization, being robbed at gunpoint, stranded in Ethiopia for 2 days. I could go on. Half way through the year I realized how much God was trying to push me to achieve something beyond my pint-size dreams and in order to do that, I had to be willing to face challenge. More appropriately, I had to be willing to seek them out, despite my aversion to failure. 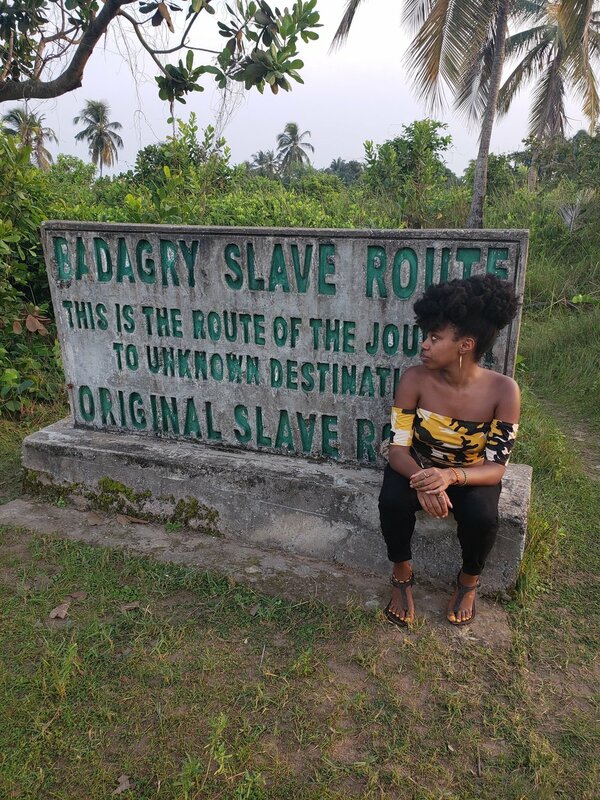 To commemorate this year of questing my destiny, I decided to take a symbolic trip to the “Point of No Return” in Badagry, Nigeria. For those of you who are unfamiliar, this is a major slave port where countless captured African people were trafficked through. It is called the Point of No Return, because once they reached the shoreline, they would never come back. I thought what better way to throw the proverbial middle finger to the oppressive, diabolic structures that be (then and now) than to return to this place on behalf of the people who came before me. After spending about two and a half weeks in Lagos, my trip was coming to a close, and it was time to make good on this symbolic journey. Some newfound Nigerian friends and I loaded up into the car, and took a four hour drive down the most poorly maintained road I had ever been on (I travel through developing countries frequently, so this is saying a lot). As we exited the main road, and headed into this quaint impoverished town I didn’t really know what to expect. We turned down Mobee street, named after the royal family, and stopped in front of a small, unimpressive building titled “The Slave Museum”. Someone in plain clothes walked up and introduced himself, offering to give us a tour. This place was but a small 14x14 room but it packed a punch. Inside were original slave relics. 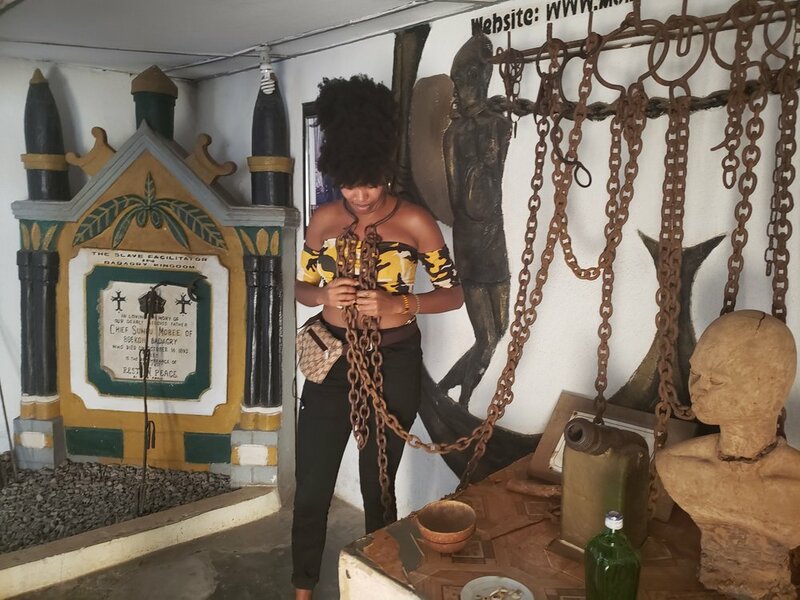 The 30-pound chains that captives wore hung near the ceiling, an empty bottle of gin marked with the price of ten slaves sat on the counter, a picture of a castrated man begging for forgiveness was mounted on the wall. The guide started to explain the items before us in Yoruba. It always stings a bit when African people have to switch to English for me. He took the rusted chains off the wall so I could put them on. The weight of them knocked me a bit off balance. He said they wore these for months at a time, and I couldn’t bear to be in them more than 30 seconds. After going through each relic in detail, he offered to take us from the mainland where captured Africans were stored, down the original route to the Point of No Return. Allow me to put a finer point on this. We were going to walk the literal path that had been taken by African people as they left in chains into the unknown. So we went. We took a boat from the mainland to the island. It was beautiful. This place could have been a resort town if it weren’t for the eerie feeling that mass human trafficking gives you. A short ten-minute ride and we were on the island. A narrow dirt path led from the dock into the distance and we embarked on this almost two-mile journey. The guide told us what it was like to be on this path so many years ago. Slaves were chained together in clusters of 15-20 wearing those heavy chains like what I had tried on earlier. They were flogged and called apes. The rowdier captives had their mouths padlocked shut. I felt like I was there. I wondered where God was. The beginning of the slave route. About halfway through we stopped at the Attenuation Well, just as the slaves had done. The Attenuation Well is infamous for its spiritual nature. The waters are believed to be intentionally tainted by white people with a spirit that causes one to forget. Victims were made to drink from this well on their journey such that they would forget their country and their life in Africa. This way if they escaped, they would never be able to return. To this day, the people of Badagry despite lack of clean water abundance refuse to drink from or interact with this well, still believing in its curse. I stared into the bottom of it, picturing each person coming up to have an involuntary sip. We marched onward. Another 15 minutes or so and we were standing at Badagry beach, also known as the Point of No Return. There was a huge modern version of the port building obstructing the beach view. Giant arches jutted up towards the sky. Here yet another ritual was performed to induce amnesia. Captives were made to circle the arches 7-9 times and once finished they were redistributed to different groups, separating families and tribes to discourage revolt. We walked to the littered shoreline, as the guide painted a picture of what those final moments on African soil were like. Kidnapped Africans paddled small boats to the larger ship that awaited in the distance. They embarked on the ship and were led down into the cargo area where they laid atop one another still wearing the heavy metal chains. If the boat became overweight, chained people were tossed overboard until the ship reached equilibrium. The lives of these people were meaningless in the eyes of Europeans. The imagery of what the guide was describing turned my stomach. About a year ago, I had done my DNA test to learn more about my ancestry. Turns out about 30% of my heritage is from Benin, my father almost 40%. In that moment, it sunk in that though I am not Nigerian, this beachfront was just a mere 13 miles from the Benin border, making it highly likely that my bloodline passed through these shores. I pictured my older family members in chains. It was all overwhelming. I thought about how successful Europeans had been in separating African-Americans and other members of the diaspora from their roots, how disjoint we were as a people, and it made me angry. I thought about how the narrative around African-American history makes us feel like our story began in chains, and we are only seeking to elevate ourselves from our desperate beginnings. This trip made me really take in that our great grandparents were human trafficking victims who had lives and loved ones. Our history was hijacked by an inhumane pursuit of capital. I had decided to visit Badagry to mark the ending of a dynamic year, but this trip turned into a milestone in my life that I will continue to draw energy from. This place is no longer The Point of No Return for me. I returned. The walk back made me smile, because I felt like I was being lifted up and smiled upon by the people who had died just trying to live. From that point forward, I vowed to pursue every dream unapologetically, and fight that much harder for equity in my community, and for cohesion among people of color. I owe it to my family members who didn’t make it where I am today, to the millions of black people who passed through the prison system, to my ancestors whose dreams could never be realized on American soil, and to my ancestors whose lives were forever changed by chains. If you are a person of African descent, just 8-10 generations removed from the continent, know that you are just that, not a descendant of slaves. With Africa being the birthplace of civilization, we have a much longer line of freedom, than captivity. So, every time you fight for justice and equality, know that it is not something you are fighting to get, it is something you are fighting to get back, which is very different.